There is no official figure announced yet by DHA Multan, but may be it will between 17 to 20 lacs per Kanal. How can we know the file we are purchasing is situated in phase 1 or not. Also please let us know which mouza are in phase 1. The best way to confirm it from DHA Multan office. Mouzas details can also be taken from DHA Multan office. 10 Marla file category is not available in DHA Multan. Hope fully in booking DHA Multan will offer 10 Marla files also. Atif Bhai, why suddenly the prices are sky-rocketing? I am from multan & the people perceive the project to be very slow. DHA wants to lauch at rates equivalent to peshawar? There are many factors behind this rise. Limited supply is one of the reason and also DHA Multan is launching booking plan soon. Atif Bhai, DHA Multan main itni khamoshi kyo hai. now market news is that u have to wait 10 years before it become habitable. I dont think it will take 10 years to be livable, however we should not expect less then 5 years. This is good development with regard to balloting. Please evaluate the current files rates and announced rates. Do you think its worthable to purchase files since its in phase-1. 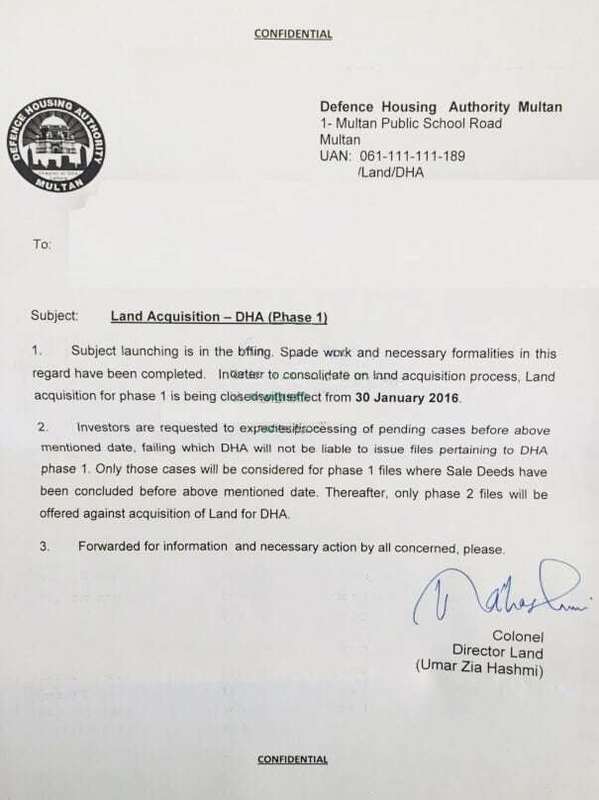 Sit it is “Land Acquisition for DHA Multan Phase 1 is being closed w.e.f 30 January, 2016” not balloting is closed. DHA Multan is going to launch booking on installment package soon. Definite it is worth able but it is a long term investment.